Status: Unsure on how to proceed. Still, it’s a problem to consider, and one that probably means I’ll wait at least another year before going to war. It also means my next target is probably Wallachia, just to remove one high-AE country from the map. By my calculation, Hungary is not going to get into Coalition levels of AE if I vassalize Wallachia. Since I’m planning on vassalizing Wallachia, that’s a 50% reduction, taking it to 20 AE. Then a border hop should reduce that a bit. Hungary has 30 AE already, and it’ll be a bit lower by the time I peace out with Wallachia. So I should be barely OK. The war actually goes quicker than expected, but by a combination of improving relations with a bunch of faraway countries, and a lucky event that gives me a bunch of free prestige, I barely manage to vassalize Wallachia without risking a coalition forming. If I don’t break that alliance, I will be stuck with two avenues of expansion blocked, and I’ll be at the mercy of any coalition forming that includes one of those two states. And such a coalition would be inevitable: either I expand in Christian lands which would make Hungary eventually go into Coalition, or in Muslim lands in which case the Mamluks would join.. But that means it’s time for a big war. You’d think that for a game about world conquest, battles would have been one of the subjects I’d have covered early. But EU4 combat is quite abstracted, and it’s not something that I bother micromanaging. But let’s cover them now, while they’re still relatively simple. Armies are made of thousand-men regiments. Regiments can be infantry, cavalry or artillery. We’ll cover artillery later, when it finally enters the fray, but for now I can only field infantry and cavalry. Cavalry is more expensive, but much more powerful and durable than infantry. However, barring a few exceptions, you need lots of infantry to support your cavalry or your army will take a tactics penalty. Also, infantry takes the brunt of losses, so you need to have extra infantry to compensate for that. To compound that, terrain also affect how many regiments can join the battle, as do your tech level, through a concept called combat width. Basically, your troops form a line of regiments (infantry covering most of the center position, and the last few spots on each side of the line being occupied by your cavalry. The tech level determines the maximum possible width, and terrain reduces it. Once artillery enters the game, it can fire from a second row of regiments onto the enemy army, but otherwise you’re stuck with that line formation. Now, there are tons of factor that go into figuring out an army’s strength and resilience. But again, it’s not something worth micromanaging. It’s a bunch of little modifiers that add up to something great. First, armies intended to see combat need leaders. Leaderless armies can be broken completely (disappearing from the map entirely), while even on a defeat an army with a leader will almost always just retreat (thus saving some of your men). Plus leaders give significant bonuses, especially in the early game, so a good leader is one of the few ways to give a visible boost to your army. Second, when at peace, it’s a good idea to drive down the army maintenance slider. Your soldiers’ morale will collapse, but who cares, we’re at peace. But when you do go back to war, make sure you’ve paid your soldiers in full for a few months, because low-morale units don’t last long in combat. Now, this has barely touched upon all the little fiddly bits that make EU4 combat. But if you want more detail, head over to the wiki. Blog will continue. Editing will continue. Progress will continue. Novelwriting is on hiatus unfortunately as I find my footing again. Status: Depressed at my small, small size compared to how big I was last game. I have a couple of false starts (allying with Crimea and getting dragged into one of Crimea’s patented “let’s piss everyone off” war, overreaching and getting Europe angry at me) as I readjust to “not-monstrous-blob” play. 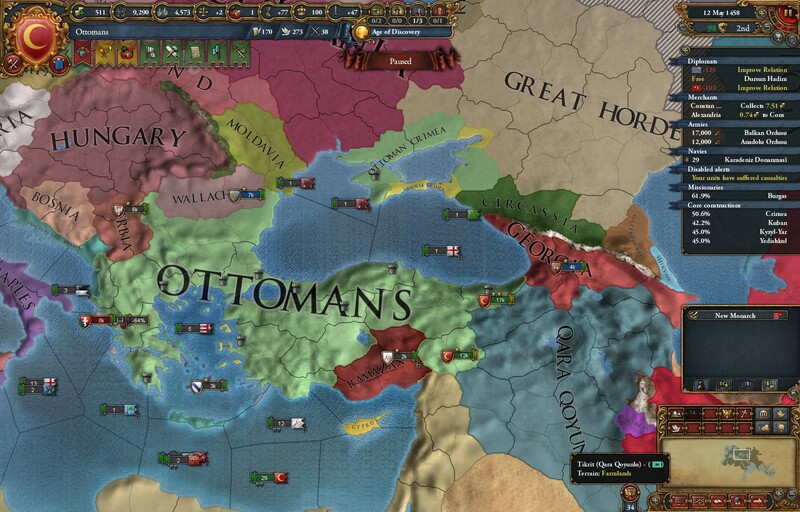 Then I set up my alliance with Bohemia, and go with my usual opening of wiping away Albania and Byzantium. Then I take on Trebizond and Theodoro. Then Poland and Lithuania again decide not to form a personal union. Cool start. And then Qara Qoyunlu eats Aq Qoyunlu. Whoa. That’s… actually a fairly significant development, setting me on a path to war against Qara Q early. And then I get a random event that’s usually no big deal. I’m about to click it away then I realize it means I could get a development discount in Edirne, one of the province in Thrace, my capital region. Ergo… it’ll be cheaper to force the Renaissance there when it appears, meaning this isn’t an irrelevant event, it’s a major boon. 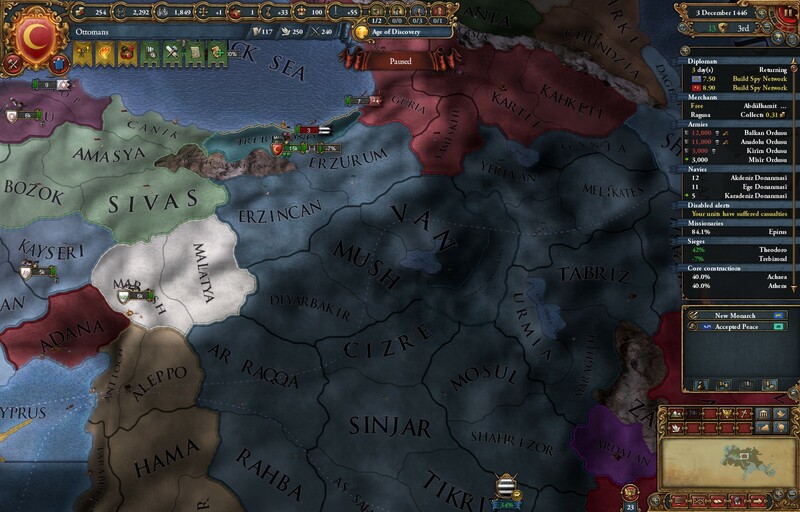 Then I notice that somehow, Ramazan, one of the minor countries on my south has allied with the Mamluks. It’s bothersome but not a huge issue – I think. It’s not something that usually happens, so hopefully this means the Mamluks failed to get one of their more significant alliances up, but I’ll need to check that out. Really – this game just got interesting. That’s not how the early game usually pans out. 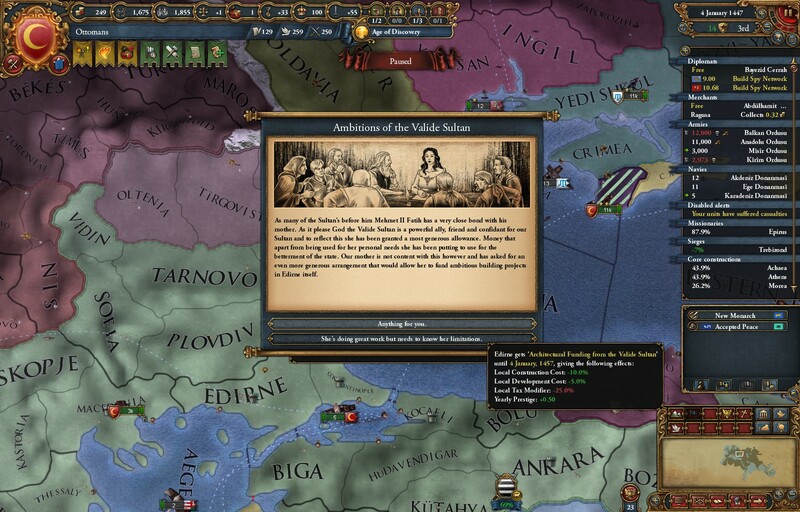 Typically, Qara Qoyunlu will take its time vassalizing Georgia, letting me eat reconquer Aq Qoyunlu. And the Mamluks ignore Ramazan, letting me eat them without trouble. Interesting times. Over the course of the next few wars, I slowly build up my territory, recovering cores and capturing the small local powers. Those wars are pretty much formalities: crush the small opposing force, siege everything, win. Then I vassalize Georgia, triggering the first coalition of minor powers against me. Time to let the men take a breather. Oh, also, the Renaissance happened. Institutions are the current system intended to simulate the evolution of technology. In the time period covered by EU4, Europe saw rapid technological development while most of the rest of the world didn’t. The idea behind Institutions is that they’re the cultural forces which made that fast technological progress possible. How they work is that as soon as an Institution appears, technological costs go up for all countries that haven’t Embraced the institution. It’s a small tick (1% per year, topping at 50% per institution) that ends up being prohibitively expensive. 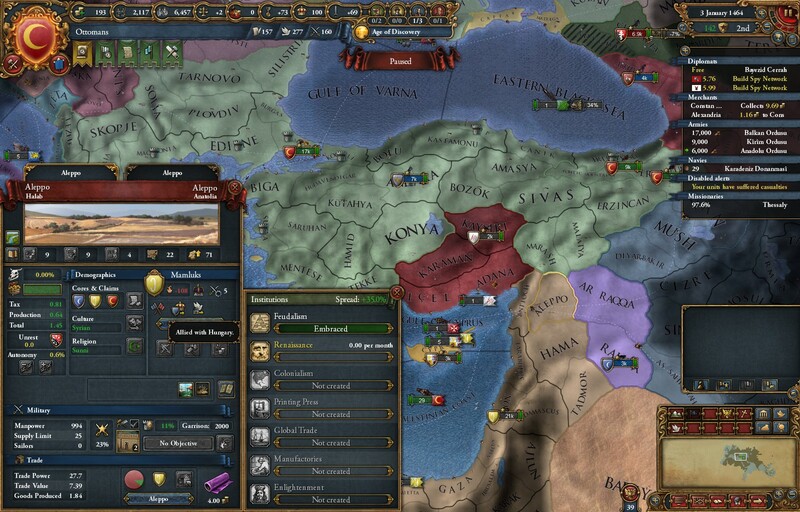 If you have the right expansion installed (Common Sense) you can spend monarch points to develop provinces, which also speeds up adoption of an institution in a province. It’s the only way you can affect Institution spread inside a province, with one exception. Institutions are adopted over time by provinces – each province slowly ticking upward to adoption. And once provinces totalling 10% of your Development value have fully embraced an Institution, you can force the rest of your country to embrace it, erasing the tech cost penalty at a rather high cost in ducats. Lots of factor affect institution spread (and they vary depending on the institution), but at least in the case of the early institutions like the Renaissance and Colonialism, you’ll want to force one of your provinces to adopt the institution as fast as possible, so that it can then spread more quickly to surrounding provinces. The thing to understand is that institution spread is incredibly slow except for that Friendly province factor. Waiting for the spread to occur naturally means you’ll have to buy multiple tech levels at a large penalty. So it makes sense to throw monarch points at a province, just to get the institution in one province to start that faster spread. I’m a huge David Weber fanboy. Scratch that. I’m a huge fan of his Honor Harrington series, as well as of some of his other works. The Safehold series, of which At the Sign of Triumph is part… not so much. 1-Unwarranted Doorstopper Syndrome. It’s, so far, nine big books long… for a series that could probably have been pared down to maybe six medium-sized books. The problem is that Weber really wants to give the readers at least a quick look at every major engagement in a world-spanning war. Which leads to a lot of awfully formulaic “Character X’s viewpoint of Battle Y, whose outcome is pretty much a foregone conclusion.” That’s bad enough… but then there’s problem 2. 2-Tech-Driven Lack of Tension: The main conceit of the series is the rapid reintroduction of various bits and pieces of technology. The good guys benefit from that, while the bad guys are effectively opposing the introduction of that tech. Then to compound that, the main protagonist has indistinguishable-from-magic levels of tech available to her as well. I think Weber wanted to show the entirety of the conflict and the detail of the evolution of military tech… which is interesting from a very dry worldbuilding/world management perspective, but really makes most of the books in the series feel the same. And At the Sign of Triumph, despite being at least the end point of the first major arc of the series, doesn’t buck the thread. There’s a supposedly big military conflict looming for most of the book – but it gets neutered by a simple intelligence ploy (in a series where the bad guys’ spies have been ridiculously ineffective from day one.) There’s one last series of naval battles which are just a victory lap for the good guys’ navy (because the naval war was conclusively won at least two or three books ago.) And ultimately the big bad gets taken down for the count in a handful of pages by minor characters, yet another application of magic tech, and a logical but utterly undramatic series of events… which coincidentally doesn’t resolve the core conflict of the book, so that another series taking place 25 years later can be written on the same premise. So… not a recommendation, unless you have an enormous amount of free time available, or a passion for the nitty-gritty of Age of Sail/Early steam naval warfare. Well, I’m slowly beating my backlog into submission. With this post I’ll be up to date on blog content, I’m catching up (slowly) to where I want to be on revisions for Book the First, and I’ve completely cleared my free-time schedule so I should be able to make up some lost ground on the actual writing of books. In addition, I have another work-light week, so I should be able to keep making progress at a good clip. I really want to diversify my projects a bit – in particular, I want to get started on the blog redesign and theme. But that’s a reward I’ll give myself once I’m closer to being in control of my workload. The whole “scrubbing out on the LP” was in theory a setback, but honestly, I wasn’t that happy with my blog post anyway. So it’s a mixed blessing – the content I’ll eventually produce there will be better than it would have been otherwise. So – back to work! And by that I don’t mean (just) playing EU4. I think. … and we’re done. Great run, but we just couldn’t do it. Heh. Actually, I made it to 1710, had my best game yet, but then I got greedy and triggered a coalition war. I could probably play the game out, but between that, a few other dumb mistakes and a lot of small, suboptimal plays, I don’t think that particular World Conquest is salvageable. I learned a lot, though, and I’m not about to quit such an interesting project. So I’ll restart in a couple of days. Meanwhile, here are some of the lessons I learned during this playthrough. 1-Fight wars to 100% warscore (or near to 100%) – in the early stages of the game, I wasted lots of time and manpower by going for early peace agreements. That’s a crushing mistake: by the time the enemy is willing to sign a peace deal at 35% or so, you’ve generally won the war anyway. Driving up the warscore higher is a formality by then. 2-Focus my aggression. It’s not always possible, but it’s better to kill off a nation completely than to have it stick around with 150 AE. That’s something I should absolutely have done throughout the entire run. The coalition that ruined me in the end wasn’t a huge European blob, it was a dozen country from all across the world. 3-Don’t ignore the economic game. In this playthrough I learned the importance of trade, but also that ignoring the invest-reap rewards value of buildings and ships was deadly. … and tons and tons of nifty little tricks.